Hello and a very warm welcome to you. Thank you for joining me here today. 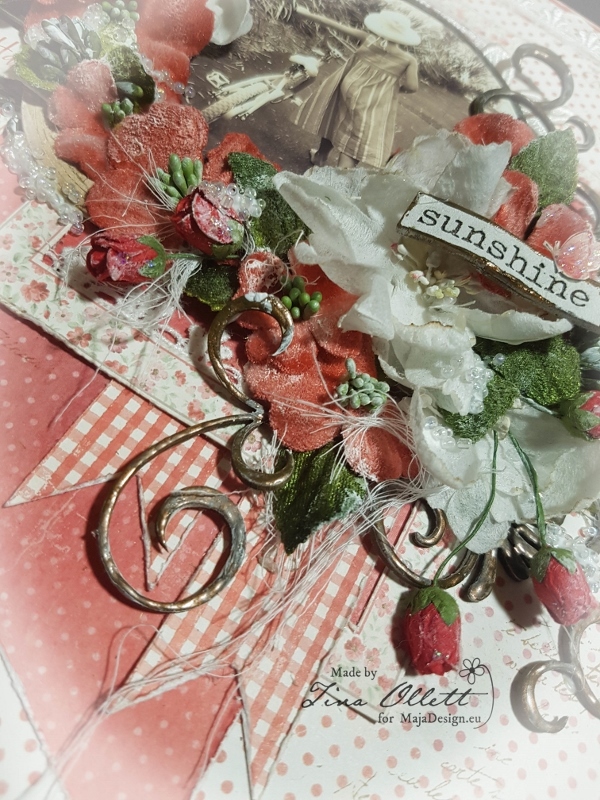 I have my second Design Team layout for the month today and yet again I am using the gorgeously stunning Summertime collection. I am not usually into red but this has really got me working on it. 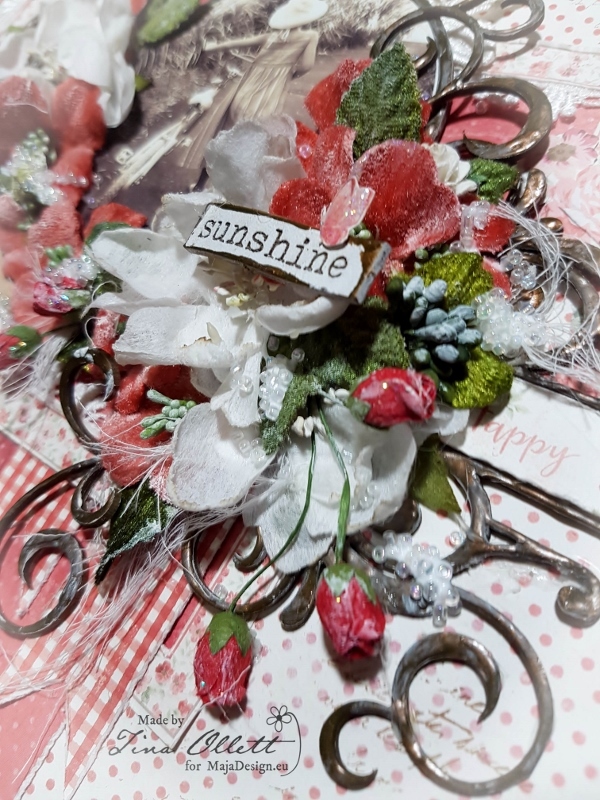 I have simply titled this “Sunshine”, well because I live in a very warm climate, sunshine is what we see the most of and the day I took this photo of my littlelist it was exactly that …..Sunshine. This layout was very labor intensive for me. I had laid it all out and then of course changed my mind part way through and changed it all back around again. 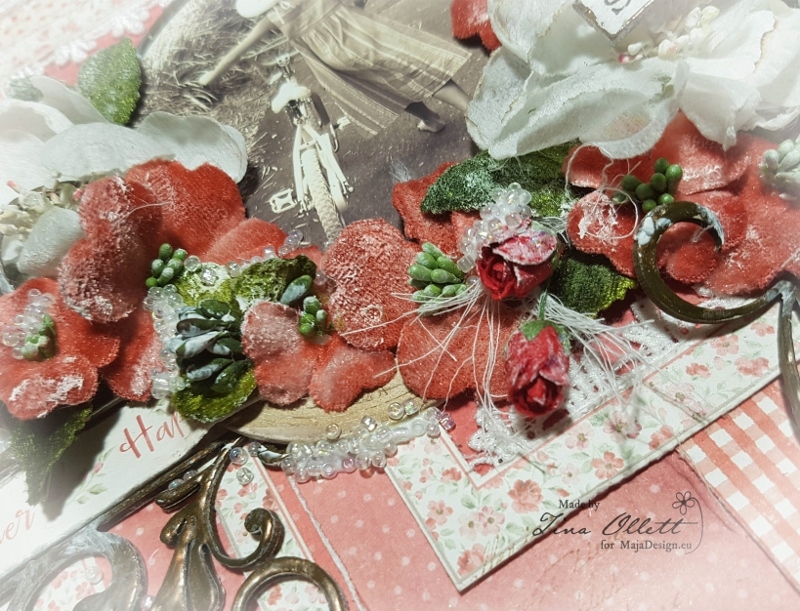 I have used Dusty Attic’s February Moodboard as inspiration for the starting point of my layout, that being the sketch in a sense. I kept my layout very clean without using too many mediums this time around. I have used Summertime’s “Light Scarlet” and “Is always the best, bs” alternately as background pieces. I hand cut a border into “Is always the best” and distressed a lot of the sections that I wanted the “Light Scarlet” to show through. I have also used only one sheet of the “Light Scarlet” but gutting the centre section and cutting banners from the middle section for the inserts of my Die Cut cards. 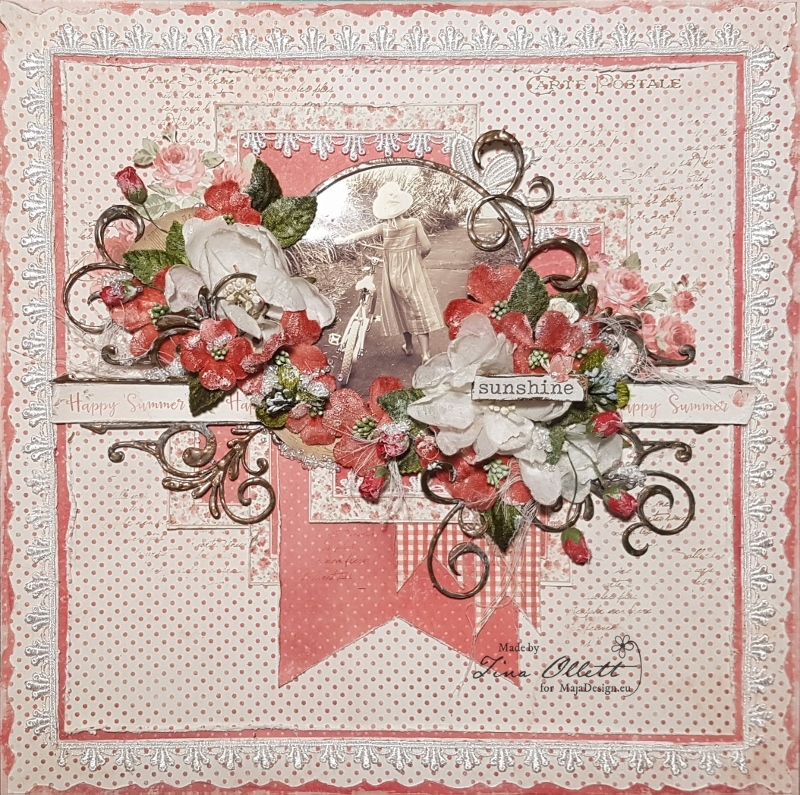 “Smell the Roses” would have to be my favourite piece from this collection along with the Garden Diecuts and the Polka Dots, oh heck the whole lot really is a favourite with me. I truly could keep using this collection over and over again. As you can see above, I have used the strip from the base of “Light Scarlet” and a banner running through the middle of my layout. They are really gorgeous the strips………I never ever throw mine away. Always perfect for a title or just a little subheading tucked in a flower cluster. And speaking of flowers, well I have used some……well a lot, along with some gorgeous velvet leaves from Green Tara and some miscellaneous rose buds on long stems which I just adore. 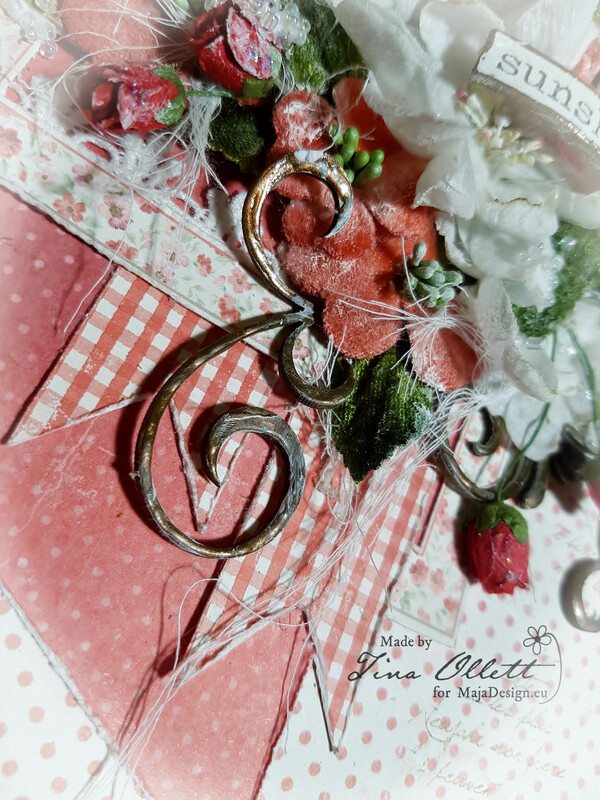 I embellished the remainder of my layout using Dusty Attic chipboards. They were dressed in Liquid Pearls and gesso. I have also scattered in some seed beads for good measure and a little cheesecloth to soften the layout a little further. Well that is it from me today. I so hope I have inspired you in some way to get out those summer photos and scrap the special memories behind them. Until next time take care and happy scrapping. This is soo sooo gorgeous Tina, I really love what you´ve done here. Amazing photo and perfect how you entered it into the lay out here, everything just goes sooo well together in one.